Student loan borrowers plan to spend $1,977 on holiday travel in 2017, according to a new survey by Student Loan Hero. Taking a road trip can save you hundreds of dollars, even if you need to stay overnight along the way. The average cost of holiday travel is too much for some people with student loan debt; roughly 1 in 5 student loan borrowers can’t afford it. 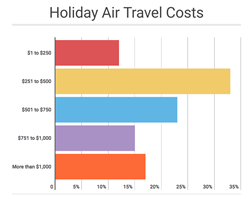 Holiday travel costs can vary wildly depending on how and where you plan to travel. For example, traveling by air is almost always more expensive than traveling by car. It’s also much cheaper to stay with family or friends than to book a hotel. Fifty-five percent plan to fly. More than half of those travelers will spend between $251 and $750 on airline tickets, and 17 percent plan to spend more than $1,000. Forty-three percent will drive a personal vehicle. Two-thirds of these road trippers expect to spend less than $200 on gas. Sixty percent plan to pay for their accommodations, with more than half of those travelers expecting to spend more than $500 on hotel, resort, motel, and Airbnb stays. Sixty-nine percent will spend $500 or less on miscellaneous holiday travel expenses, including food, airport and hotel parking, and rental cars. Methodology: Student Loan Hero gathered the above results through a Survey Monkey survey completed on October 18, 2017. The survey collected responses from 1,008 millennials and Generation Xers. Less than 1 percent of respondents were baby boomers.